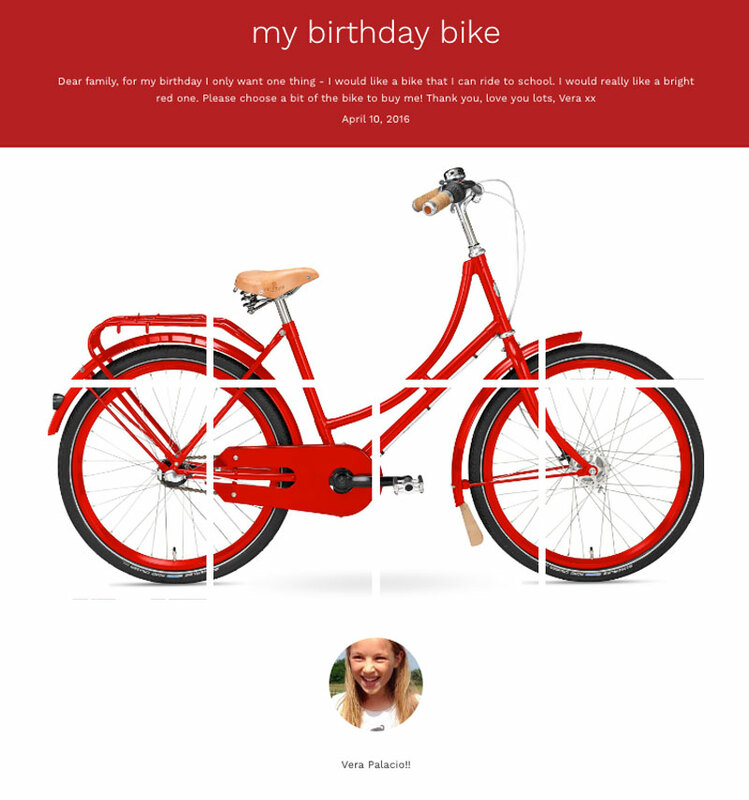 Vera knew exactly what she wanted for her 12th birthday – a shiny new bike. And she knew exactly how to ask for it. She made a patchwork and sent it out to her family, who all chipped in towards the new wheels she was dreaming of. We asked her all about it. Hi Vera, what did you decide to make a patchwork for and why? I wanted to make a patchwork for a bike. I always had different bikes when I was little but I kept getting too big for them so always had to hand them down to my cousins and friends. Now that I’m 12 I want a proper bike that I won’t grow out of too quickly. One that I can ride to school and everywhere! Who chipped in towards your birthday present? Now I’m 12 I’ve got my own phone and my own email. So once I’d made my patchwork on my phone I sent out an email to all my family asking them to help buy me a bit of my bike. It was exciting in the two weeks before my birthday because when they bought bits of my patchwork I could see all their messages popping up and check how much money they had given me on my phone. Great. I was so happy and excited. On the day of my party I went to Waterloo with my Mum, Dad and little brother to pick up the bike. First of all I thought I wanted a red one but when I saw the shiny blue one in the shop I loved it more. We had to wait for the man in the shop to build it and so we went to the cafe. Then I rode it all the way along the river and took it on the train and then rode it home. How did you feel when you got your present from everyone? When everyone arrived at the party my bike was there waiting in the garden. It wasn’t a surprise for me because I knew I wanted it so much. But it was definitely a nice surprise for all my family to see me riding my bike. Luckily it was a sunny day so we had cake in the garden and I rode around and around. My aunt and cousins live abroad at the moment so they couldn’t come to the party but they can see photos of me on my bike, which we are turning into postcards to say thank you to everyone. I haven’t ridden my bike to school yet as I need a lock but I like riding it around Brockley and showing all my friends. Thank you Vera! We’re so glad we could help you get your special bike. 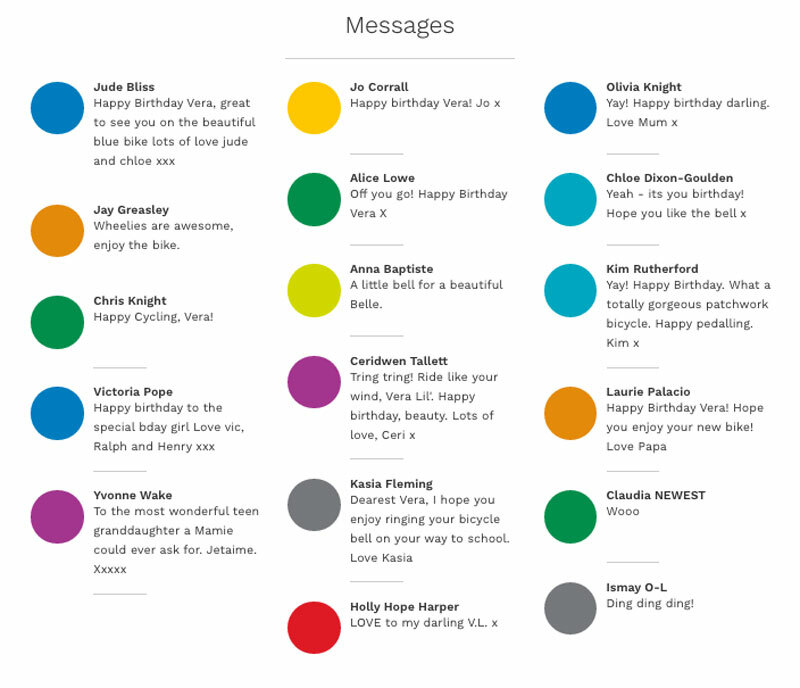 If you’re inspired to chip in for a bike, you can customise our birthday bike patchwork here. You can also browse our readymade patchworks for more gift inspiration, or create a patchwork from scratch.